Today marks what would have been Dr. Martin Luther King Jr.’s 88th birthday. Presidential historian Irv Gellman details King’s relationship with then Vice President Nixon in his very insightful and revealing book, The President and the Apprentice: Eisenhower and Nixon, 1952-1961. The two first met in March 1957 while on a trip to Ghana to celebrate the county’s independence from Great Britain. 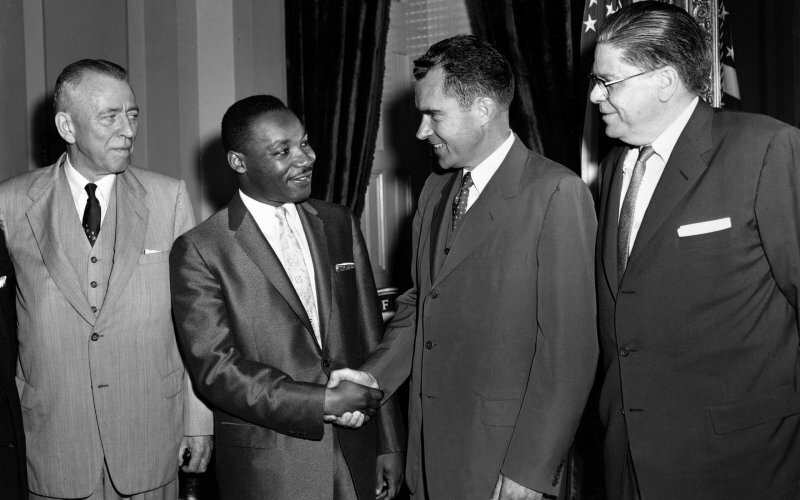 In June, King met again with Nixon at his Capitol Hill offices to discuss the administration’s Civil Rights efforts. The reason for the meetings points to Nixon’s centrality in the Eisenhower administration as a chief advocate on rights for African Americans. Senator Richard Russell of Georgia led the attack on Part 3, accusing the attorney general of conspiring “to destroy the system of separation of the races in the Southern states at the point of a bayonet.” Johnson eventually told Eisenhower he had the votes to kill the entire bill unless the president dropped Part 3. Eisenhower reluctantly capitulated. “We can at least be sure that we are moving steadily and ahead,” King concluded. The 1957 bill became the basis for a second piece of legislation in 1960, and ultimately the landmark Civil Rights Act of 1964 and the Voting Rights Act of 1965.